As a Sept. 30 expiration date looms for the U.S. Immigrant Investor Program, better known as the EB-5 visa program, congressional negotiators are expecting to extend the program even as they debate significant changes governing the alternative financing source for foreign investment in commercial real estate development projects. 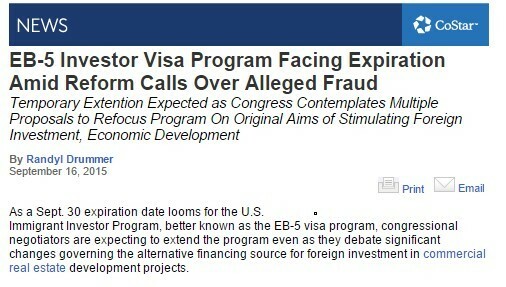 The EB-5 regional center investment program, which allows foreign nationals to bypass long waits and obtain green cards in exchange for investing in U.S. job-creating ventures, is scheduled to sunset on Sept. 30 unless lawmakers pass either a reauthorization or extension as part of what will likely be a continuing resolution to keep the federal government running beyond the end of the month.